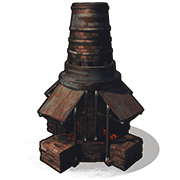 The large furnace is larger than its furnace counterpart, it can hold more and smelt ore faster than the original small furnace, but unlike the original furnace, the large furnace can only be placed on terrain. Useful for stacking more ore's for quicker cooking time. You have to place this on the dirt/sand/snow etc, but you still need to protect it! Place wood/stone walls/gates around it, so other players cant loot it without raiding you! Spread out your ores in it. You still need 3 slots. 1 Slot for putting the wood in. Another slot for the coal. And for the last spot, your smelted ore. What this will do it would make the cooking time more faster.